Alien Addition is a math game that helps students with learning addition using an alien invasion theme. Invading spaceships with addition problems move down from the top of the screen toward a laser cannon on a platform at the bottom. Canoe Penguins is a multiplayer math game that allows students from anywhere in the world to race against each other while practicing multiplying two-digit numbers! Canoe Puppies is a multiplayer math game that allows students from anywhere in the world to race against each other while practicing adding two-digit numbers! Capital Penguin is a geography game that provides practice in learning states and their capital cities. The target capital appears under the penguin. The student must jump to the matching state, in the form of an iceberg, that floats toward the penguin. Coconut Vowels is a language arts game that provides practice in spelling. Coconuts with partial words fall to the beach. The student must match missing letters to the correct word coconut. Country Toad is a geography game that provides practice in learning countries and their capital cities. The target capital appears under the toad. The student mus jump to the matching country, in the form of a lily pad, that floats toward the toad. Demolition Division is a math game that helps students with learning division. Tanks with division problems move toward your base defenses. Dirt Bike Comparing Fractions is a multiplayer math game that allows students from anywhere in the world to play tug of war with each other while practicing comparing fractions! Dirt Bike Proportions is a multiplayer math game that allows students from anywhere in the world to race against each other while completing equivalent proportions! Division Derby is a multiplayer math game that allows students from anywhere in the world to race against each other while practicing division! Dolphin Dash is a multiplayer math game that allows students from anywhere in the world to race against each other while practicing counting money! Dolphin Feed is a multiplayer math game that allows students from anywhere in the world to compete against each other while practicing counting money! Drag Race Division is a multiplayer math game that allows students from anywhere in the world to race against each other while practicing their division facts! Ducky Race is a multiplayer math game that allows students from anywhere in the world to race against each other while practicing subtraction! Elephant Feed is a multiplayer language arts game that allows students from anywhere in the world to compete against each other while matching synonyms! Furious Frogs is a multiplayer language arts game that allows students from anywhere in the world to compete against each other while matching antonyms! Giraffe Dash is a multiplayer math game that allows students from anywhere in the world to race against each other while practicing telling time! Giraffe Karts is a multiplayer language arts game that allows students from anywhere in the world to race against each other while practicing subject verb agreement! Giraffe Pull is a multiplayer math game that allows students from anywhere in the world to play tug of war with each other while practicing telling time! Grand Prix Multiplication is a multiplayer math game that allows students from anywhere in the world to race against each other while practicing their multiplication facts! Hungry Puppies is a multiplayer math game that allows students from anywhere in the world to compete against each other while practicing adding decimals! Integer Warp is a multiplayer math game that allows students from anywhere in the world to race against each other while practicing multiplying integers! Island Chase Subtraction is a multiplayer math game that allows students from anywhere in the world to race against each other while practicing their subtraction facts! Jet Ski Addition is a multiplayer math game that allows students from anywhere in the world to race against each other while practicing their addition facts! Jumping Chicks is a multiplayer math game that allows students from anywhere in the world to race against each other while practicing counting! Kangaroo Hop is a multiplayer math game that allows students from anywhere in the world to race against each other while practicing shape recognition! Kitten Hop is a multiplayer language arts game that allows students from anywhere in the world to race against each other while practicing word recognition! Kitten Match is a multiplayer math game that allows students from anywhere in the world to compete against each other while practicing addition! Koala Karts is a multiplayer math game that allows students from anywhere in the world to race against each other while practicing counting with ten frames! Koala Paddleboards is a multiplayer spelling game that allows students from anywhere in the world to race against each other while practicing spelling! Meteor Multiplication is a math game that helps students with learning multiplication. Large meteors with multiplication problems move toward a space station in the center of the screen. Minus Mission is a math game that helps students with learning subtraction using a creeping slime theme. Green slime blobs with subtraction problems drip down from the top of the screen toward a laser cannon at the bottom. Octopus Feed is a multiplayer language arts game that allows students from anywhere in the world to compete against each other while matching homonyms! Orbit Integers is a multiplayer math game that allows students from anywhere in the world to race against each other while practicing adding and subtracting integers! Space Race is a multiplayer math game that allows students from anywhere in the world to race against each other while practicing multiplication! Owl Planes is a multiplayer typing game that allows students from anywhere in the world to race against each other while practicing typing and keyboard skills! Penguin Hop is a multiplayer geography game that allows students from anywhere in the world to race against each other while matching states and capitals! Penguin Jump is a multiplayer math game that allows students from anywhere in the world to race against each other while practicing multiplication! Pony Division is a multiplayer math game that allows students from anywhere in the world to play tug of war with each other while practicing their division facts! Puppy Chase is a multiplayer math game that allows students from anywhere in the world to race against each other while practicing decimal conversion! Puppy Hop is a multiplayer language arts game that allows students from anywhere in the world to race against each other while practicing letter recognition! Puppy Pull is a multiplayer math game that allows students from anywhere in the world to play tug of war with each other while practicing decimal conversion! Ratio Blaster is a math game that provides practice in finding equal ratios. Invading spaceships with ratio problems move down from the top of the screen toward a laser cannon on a platform at the bottom. Ratio Martian is a math game that provides practice in recognizing ratios. The martian is always hungry and eats ratios to survive. Ratio Stadium is a multiplayer math game that allows students from anywhere in the world to race against each other while matching equivalent ratios! Sailboat Subtraction is a multiplayer math game that allows students from anywhere in the world to play tug of war with each other while practicing their subtraction facts! Sky Chase is a multiplayer typing game that allows students from anywhere in the world to race against each other while practicing typing and keyboard skills! Snow Sprint is a multiplayer math game that allows students from anywhere in the world to race against each other while practicing multiplying fractions! Speedway is a multiplayer math game that allows students from anywhere in the world to race against each other while practicing adding fractions! Spelling Bees is a multiplayer spelling game that allows students from anywhere in the world to compete against each other while practicing spelling! Spider Match is a multiplayer math game that allows students from anywhere in the world to compete against each other while practicing adding and subtracting integers! Swimming Otters is a multiplayer math game that allows students from anywhere in the world to race against each other while practicing multiplication! Toad Hop is a multiplayer geography game that allows students from anywhere in the world to race against each other while matching countries and capitals! Tractor Multiplication is a multiplayer math game that allows students from anywhere in the world to play tug of war with each other while practicing their multiplication facts! Tugboat Addition is a multiplayer math game that allows students from anywhere in the world to play tug of war with each other while practicing their addition facts! Turtle Dash is a multiplayer language arts game that allows students from anywhere in the world to race against each other while practicing spelling! Typing Jets is a multiplayer typing game that allows students from anywhere in the world to race against each other while practicing typing and keyboard skills! Verb Viper is a language arts game that encourages your child to choose correct verb tenses (present, past, past participle), recognize correct verb forms (ran instead of runned), and recognize subject/verb agreement (I am, he is). Word Frog is a language arts game that provides practice in matching antonyms, synonyms, and homonyms. The target word appears on the frog, with the word category underneath defining the relationship to be matched. Word Invasion is a language arts game that provides practice in parts of speech. Jellyfish with words drift toward the octopus at the bottom of the screen. 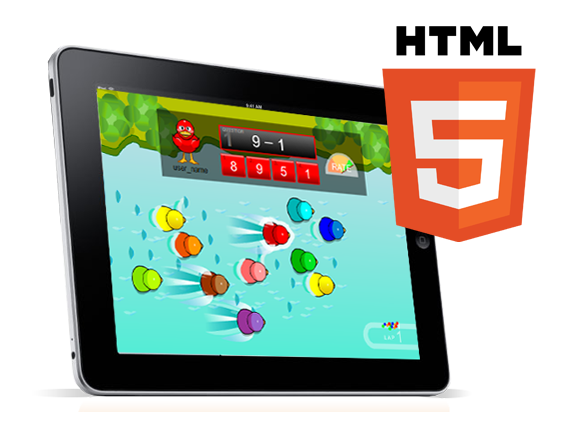 Arcademics games are built with the latest HTML5 technology, so they can be played seamlessly on any device using the Web browser. We also have apps available for the iPad and Android tablets. We make multiplayer educational games - free math games, free language arts games, and more for K-8 students. With Arcademics Plus, teachers and parents can view data reports and customize game content. Arcademics games can be played on the iPad app and Android app.